There is a great deal of gear that’s crucial when it comes to alpine and winter climbing, in fact due to it’s nature - you only carry what is absolutely essential - you could say that it’s all crucial. But when it comes down to technical climbing there isn’t anything that makes or breaks a route than hand-wear. There are reams of articles on this site dealing with this subject, written over many years, many climbing experiences, and influenced by new trends. Of these one of the biggest jumps in performance was the introduction of the Black Diamond Drytool glove - a pretty big leap in toughness, dexterity and handling (as in you can handle gear without feeling like you’re hand belongs to someone else). BD did a great job with these gloves, and they have remained a staple among winter climbers for many years. BUT the downside of the drytool styel glove is that although in moderate dry cold they provide enough protection, on colder climbs and frigid alpine routes (and belays), they become far less effective, and most climbers will have to switch to a thicker glove or mitt, or jump between the two (or three or four) as the climb progresses. - Having more gloves means dropping a glove isn’t so traumatic. - Having spare gloves means you can switch to dry gloves as you progress. - You can adjust your glove system as the climb/terrain dictates. - Increases the chance of a lost glove. - Increases the weight of gear. 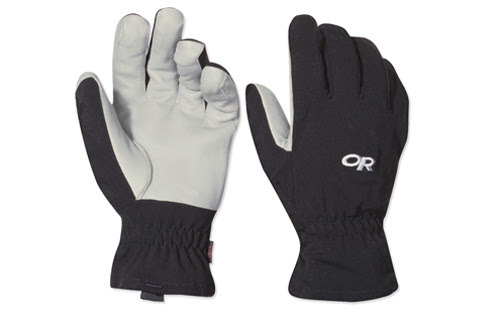 - Slows things down, both in changing gloves, and warming hands when the gloves worn are no longer effective. - Wet gloves will freeze in your pack, making them hard/impossible/dangerous to put back on. The reliance of good hand wear has become increased since the adoption on leashless tools, or tools with removable leashes, which require more dexterity, something offset by the fact leashless climbing increases the ability to keep fingers warmer (shaking out, faster warming etc). Never the less what’s needed is a single system that’s put on at the start of a route (10 metres high - or 1000), that gives great flexibility, warmth and dexterity in all conditions. The system I’ve developed and used over the last three years - although far from perfect - works very well - and allows easy handling of gear, good grip on tools/rock holds, and an adequate level of warmth for belays, even in pretty cold temps (-15C). The system comprises of three components. Sleeves: My climbing fleece layer has been adapted to leash-less climbing few adding an extra layer of fleece to the arms to improve warmth, with an extra long powerstrech thumbnail (ninja) style cuff also be added. This gives the arms more warmth and protects the wrist from the cold, plus adds and extra layer of warmth to the hand without reducing dexterity. The extra length in the cuff is designed to stop the cuff pulling at the crook of the thumb, which can be very painful after a while. Glove: I wear a standard Outdoor Research Vert Glove (OR’s version of the Drytool), which I replace each winter, and make sure I keep the leather in good condition with wax, repairing any damage to the tips with seamgrip. 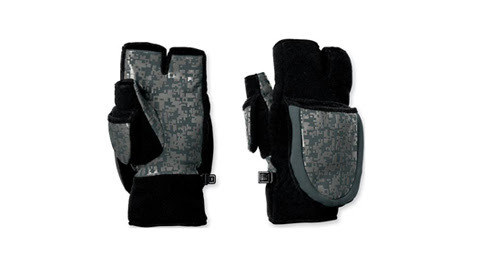 Mitt: This is an Outdoor Research Index Mitt, that is warn over the top of the Drytool glove. This is just plain fleece with a rubber palm, and I made a few modifications, like sewing the thumb down so it no longer flapped up (I found this unnecessary), and I added extra seam grip to the palms as they wore out quickly. These gloves are still far from perfect (they probably won’t last a full winter season, so will need repairing, and extra fleece patches sewing on). The last time I used this system was on my ill fated crack at the Eiger and found yet again that it worked really well, keeping my fingers warm in very cold conditions. I tend to climb with the mitts done up (flap over the fingers), pulling the flap back with my teeth when I needed to use gear, or for longer stretches of harder climbing, where you be placing more gear, or doing free moves. One system that does everything from the bottom to the top of the route, no taking gloves on or off. Saying that I would always carry a pair of storm mitts just in case you drop a glove/mitt, or for really bad conditions. Having a single system stops any one part freezing up. Having warm fingers means you stay more relaxed, and climb better. Downsides of the system are if you have to remove the glove/mitt, it can take longer to put them back on, and as I said above the Index mitt does get hammered, but probably less so then a windstopper fleece mitt. At the moment I’m working on a couple of designs for a combined glove/mitt for techical climbing (that I’m hoping to sell via this site), so any feed back on this, or other systems would be great.